100 Things Bears Fans Should Know & Do Before They Die was featured in the Chicago Book Review's Best Books of 2013. 100 Things Bears Fans Should Know & Do Before They Die was reviewed on TDDaily.com, an affiliate of SLAM Magazine. 100 Things Bears Fans Should Know & Do Before They Die was mentioned in the Chicago Tribune. 100 Things Bears Fans Should Know & Do Before They Die was reviewed on Gapers Block. 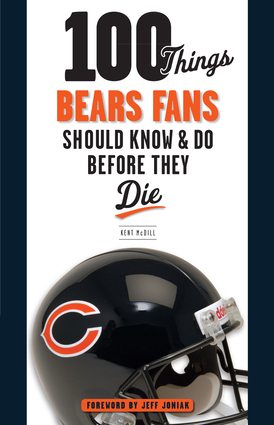 100 Things Bears Fans Should Know & Do Before They Die was reviewed on Chicago Book Review. They say, "Author Kent McDill does an excellent job ranging over both the past and present of Bears lore." 100 Things Bears Fans Should Know & Do Before They Die was mentioned on the Winnetka Talk website. Kent McDill, author of 100 Things Bears Fans Should Know & Do Before They Die, interviews live on "Millionaire's Corner Show." Kent McDill, author of 100 Things Bears Fans Should Know & Do Before They Die, interviews live on "Low Budget Morning Radio Show" on WXRX. Most Bears fans have gone to a game at Soldier Field, despise Packer green and yellow, done "The Super Bowl Shuffle," but only real fans know of the "Kansas Comet," who created the 4-6 defense, the significance behind G.H.S., the "best football name ever," whose $100,000 contract paved the way as a promotional vehicle for the young NFL and the greatest (behind-the-scenes) rivalry in Bears history. The stories behind the Walter Payton and why he was given the nickname "Sweetness"
Whether you're a die-hard fan from the days of Sid Luckman, Mike Ditka, Mike Singletary and Walter Payton or a newer supporter of Lovie Smith, Brian Urlacher and Devin Hester, 100 Things Bears Fans Should Know & Do Before They Die offers a chance to know the most important facts about the team, the traditions and what being a Chicago Bears fan is all about. Kent McDill is currently a writer for MIllionaireCorner.com. He has covered sports in Chicago for three decades, and still covers the Chicago Bulls for NBA.com. He is also a feature writer for the Professional Skaters Assocation magazine, and a columnist for the Daily Herald.